Click General under the settings menu. To create a static page within your publication, follow the steps below. Either create a New Story or edit an existing one. Click Publish or Update(for an existing story) at the top of the editor to publish the static page. To add menu items to your publication, follow the steps below. As mentioned in the Requirements section, this theme uses the Content API v2, so in order to take advantage of all the theme features make sure the Content API v2 is used, this is set in the theme by default. This theme supports the Ghost subscribers feature. To activate the feature follow the steps below. Check the box for Subscribers, under the Enable Beta Features. If the feature is active, the subscription form will appear in the sidebar. To view subscribers click Subscribers from the admin menu. To set the publication language follow the steps below. Under Publication Language, click Expand and set the language/locale to be used on the site. The default is set to English (en). This theme uses the Ghost Search Plugin by HauntedThemes. // Settings > Integrations > New Custom Integration. Copy Key. Replace ghost_key below. You will have to replace the ghost_host and ghost_key values. ghost_host should be the the domain of your blog (ex. ‘https://yoursite.domain’). ghost_key has to be generated in the admin panel. Add this key in default.hbs for the ghost_key value. Different customizations for the theme. For Escript the default value is 9, you can change it to whatever number you wish, we recommend a number that can be devided by 3. Create a new story and call it Contact. Make sure the the Post URL is contact. Check the box Turn this post into a page. To add the page to the navigation, please check the Navigation section above. The social media links are stored in a partial file partials/social-media.hbs. Click Expand under Social Accounts, and enter the URLs for your Facebook and Twitter. To edit the other social links follow the steps below. 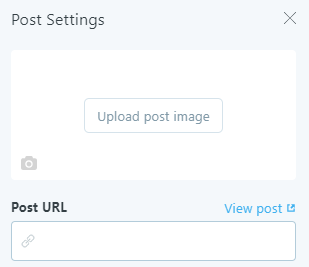 Open up the social-media.hbs file and change the href value to your profile’s URL for that specific social platform. 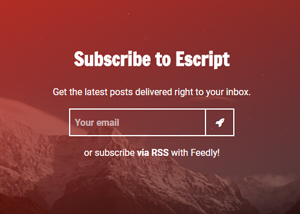 Escript comes with Disqus comments enabled. 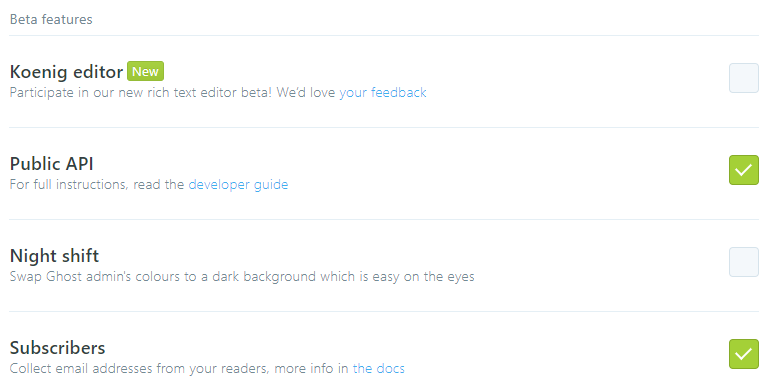 Make sure you have registered your website with Disqus and you know your disqus_shortname. Open default.hbs file located in the root folder. Change the biron-demo value for the disqus_shortname variable to match your Disqus account shortname. That’s all, Disqus comments should work now. 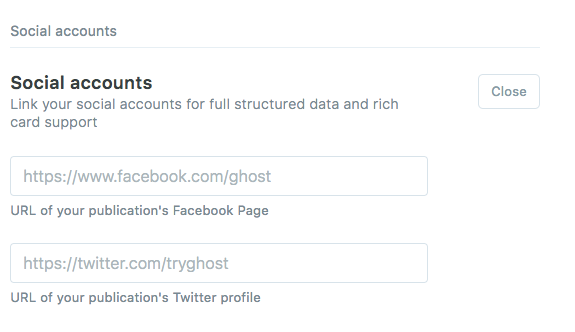 To add Google Analytics to Ghost follow this tutorial from Ghost. All the assets are combined and minified for better speed and performance. In order to customize the theme make sure you have Node.js and npm installed. You also have the option to use Code Injection to do customizations. For example if you want to change the default color of the buttons, add the following code in the Blog Header section. Images are not included in the download files!